One will often see a large circle surrounded with the pattern consisting of 2 short–2 long straight stitches, but special to this design is a smaller circle divided by a cross inside the larger circle. How to work such a design? 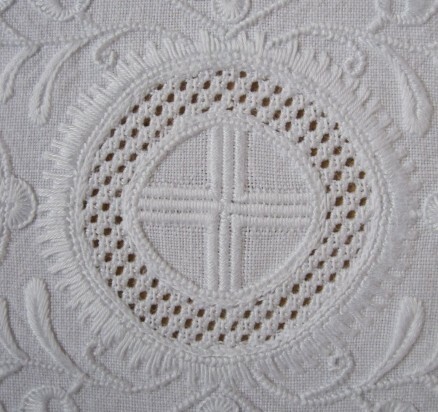 As always, the embroiderer can choose to disregard some lines and cover the enlarged area with a filling pattern. 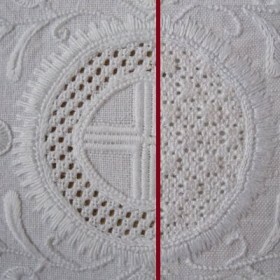 This method was chosen for the oval runner. The entire circle shape was filled with the Limet pattern “Röserich” (No. 452 [A1] Röserich Filling Patterns, pages 1-6). Coton à broder in the following sizes was used: No. 20 for the Coral Knot stitches, No. 25 for the Satin stitches, No. 30 for the Chain stitches and the filling pattern. On the rectangular runner, per the original design, I worked the cross into the inner circle. 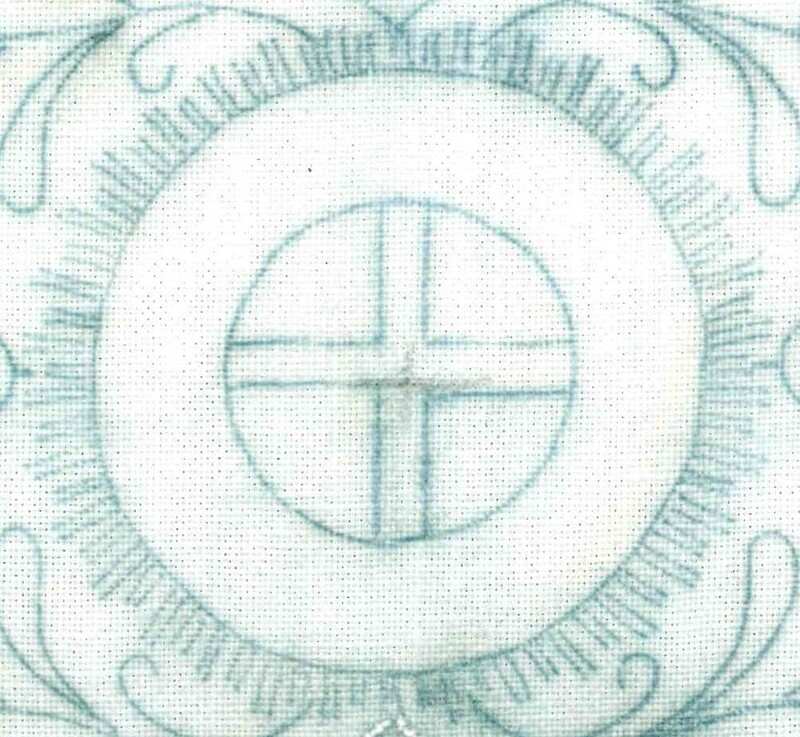 However, to make the cross I followed the fabric threads and took the line drawing only as an approximate guide. 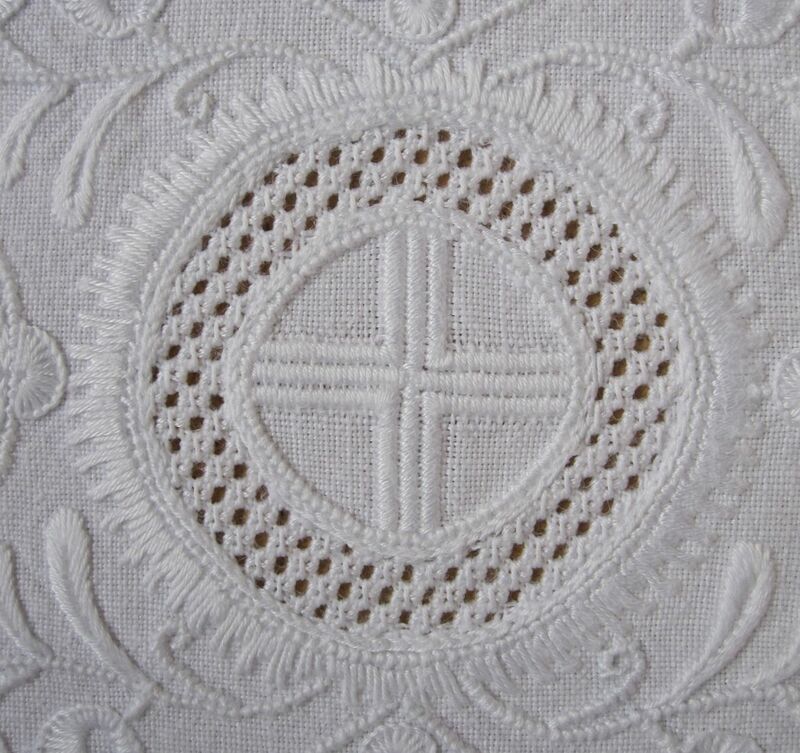 The ring around the inner circle was filled with the openwork pattern “Diagonal Cross Filling – French Variation” (Openwork Pattern Samplers, pages 26-28). 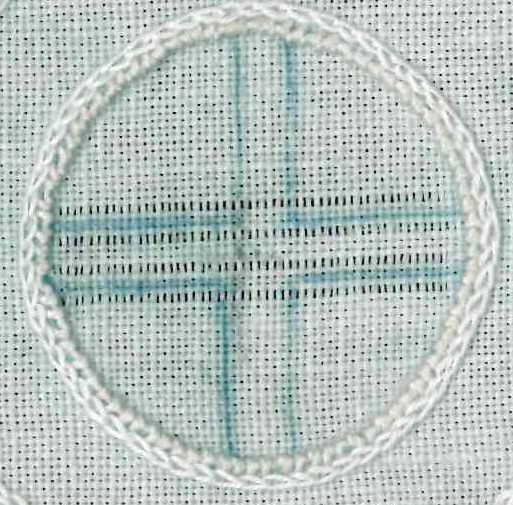 Around the ring “2 short–2 long” was worked, with the stitches placed very close together. The short stitches were worked a little more than half the length of the long stitches. Coton à broder in the following sizes was used: No. 16 for the Coral Knot stitches, No. 20 for the Satin stitches, No. 25 for the Chain stitches and the filling pattern. The previous part of this series can be found here. I just wanted to thank you again for your class 2 weeks ago. I learned so much and you were such a gracious teacher. I know Susan and Sally want to come back next year, but I will not be able to do that again. I was so welcomed at every shop I entered. Your neighbors were so welcoming, that it just made to visit more memorable. 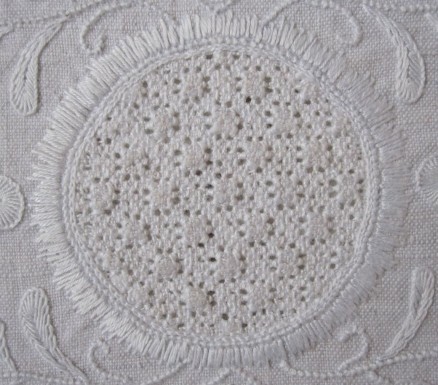 I am now working on the “Tulip” doily and hope to show my quilt club and my bible study group my results soon. My Mom was thrilled with what I learned and all my experiences while in her home country. I think she was a bit sorry that she didn’t join me.